It’s very common to have difficulty finding a job in your field after graduating. In fact, finding any job at all can be difficult! So if you have no job after college, don’t feel bad. You’re NOT alone. There are a couple things you can do to maximize your chance of succeeding though. Anyone can do this. I had almost zero network when I graduated university. I planned on moving to Korea to teach English for a year, and decided not to at the last minute. So I had no job leads, and had really neglected my network (because I thought I wouldn’t need it). So even if you have nothing right now, you can talk to your academic advisers and former professors. Talk to classmates and friends. Tell your parents and family you’re job searching too (and what you’re looking for). If people don’t know you’re job hunting, they can’t help you. If you want detailed steps on how to build your network (including by “cold” messaging people who you think could introduce you to great companies), I wrote a full article on why networking is the fastest way to find a job. But if you’re not making the most of the people you know, and occasionally taking steps to meet new people and grow your network, you’re leaving a BIG opportunity on the table. Go to local meetups related to the industry you are interested in. Meetup.com and Facebook groups are great ways to find these events. Contact people on LinkedIn and ask a question about their experience working for their employer (explain that you’re job searching and curious what the work environment is like). Word-for-word example of a message can be found here. Ask people in your current network if there’s anyone they can refer you to. Find out if they know anyone who would be valuable for you to speak with in your job hunt. I’m sure you’ve seen a lot of companies out there require experience, and won’t hire someone who is entry-level. Very frustrating, right? However, there’s one type of company that typically LOVES to hire entry level people. Fast-growing, new companies. Growth-stage companies. By applying to growth-stage companies, you multiply the chance that they’re looking for entry level people. I wrote an article about this here. Fast-growing companies often like to train people and promote from within as they build their company culture and expand their operations. You also greatly increase the chance you’ll be selected in the interview, because they’re often hiring multiple people at the same time, for the same role. Would you rather interview with 10 other people for one open position? Or interview with 10 other people for six open positions? The choice is pretty obvious. 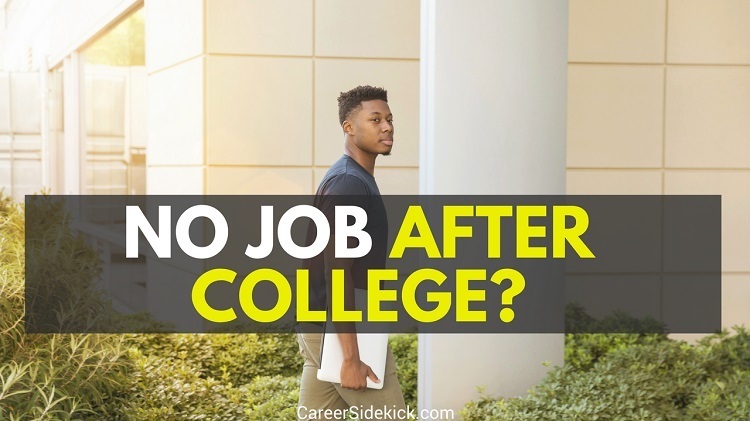 Because of this, applying directly to fast-growing companies is one of my 3 best methods to find a job right now, especially for recent graduates who haven’t found a job after college. Think about this for a second – when you go into the interview, the hiring manager has never seen you work a single day in your life. So they’re deciding whether to hire entirely based on what you say. This is the power of interview skills. What you say in the interview has the power to get you hired for the top, highest-paying jobs out there. Or if you’re making interview mistakes, employers won’t give you a chance to show what you’re capable of. It could definitely be the reason you have no job after college. The bottom line is building great interview skills can change your career and allow you to get the best jobs. If you learn how to give great interview answers, and discover what employers want to hear, you’ll have a massive advantage every time you change positions and earn far more money in your career. If you did well in school, picked a great major or field of study, and still can’t find job, it might be your location. Some regions just don’t have many job opportunities. You’re young, you just graduated. If you think your location is holding you back, and your personal life allows for it, consider relocating. Different regions have “clusters” of companies from certain industries (for example, I used to recruit for Biotech companies, and they’re clustered in San Francisco, Boston, New Jersey, Maryland, and a few other cities). Yes, you can find a biotech company out in Indiana. But it’s going to be more difficult to get hired, and you’ll be stuck with that one employer for 20-30 years unless you relocate in the future. Not good. Do your research and figure out where the “clusters” are located for this industry. What cities or regions are most of the companies located in? Once you have a list of the biggest cities/regions for your industry, pick the most attractive one or two regions based on personal factors – proximity to friends and family, cost of living, climate, or anything else you care about! Think about where you’d actually like to live. Job searching isn’t an exact science. The steps above should help you find a job after college, but you may need to test a few things, make adjustments, etc. If you send some “cold” messages on LinkedIn and don’t get any replies, change the script. If you go on four interviews and don’t get any callbacks, it’s time to work on your interview skills more and figure out where you’re making mistakes. And things don’t happen overnight. You need to apply for a lot of jobs and keep your effort going. But if you try these steps, make adjustments and improve, you WILL find a job after college. Good luck and I hope this article gave you new hope, motivation and most importantly – a gameplan you’re excited to move forward with in your job search.